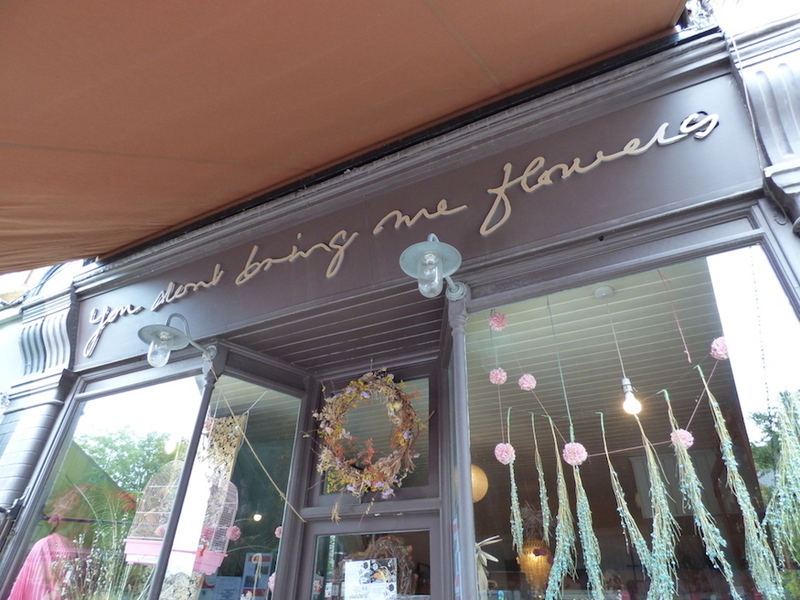 Walking into You Don't Bring Me Flowers is a more welcoming entrance than the accusatory name (presumably an homage to Neil Diamond and Barbra Streisand) would have you expect. 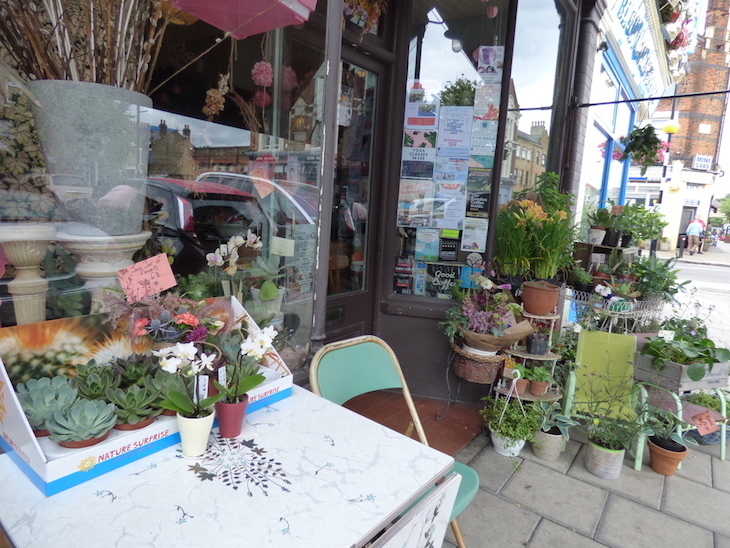 A florist and cafe all in one, it's situated in the villagey area of Hither Green, opposite the upmarket Crimson & Clover gift shop. Outside, a couple of tables and chairs adorn the pavement under an awning, topped with fashionable cacti against a backdrop of floral arrangements. So far, so yummy mummy. Fortunately for foodies, the catering part of the business dominates. Three quarters of the intimate ground floor is given over to cafe space, yet there are still only five tables to huddle around. Never mind... we're already distracted by the cake display, spilling off of the counter onto another table which had been pulled up to catch the baking overflow. 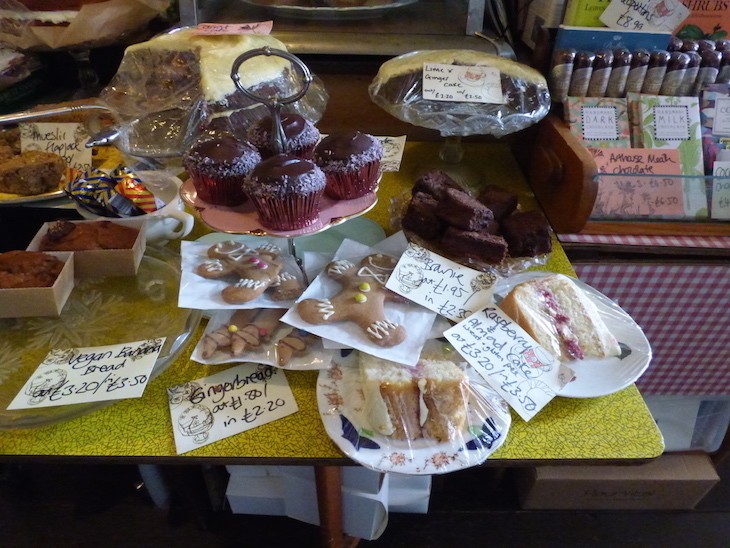 It's a homely display, more village bake sale than upmarket London bakery. 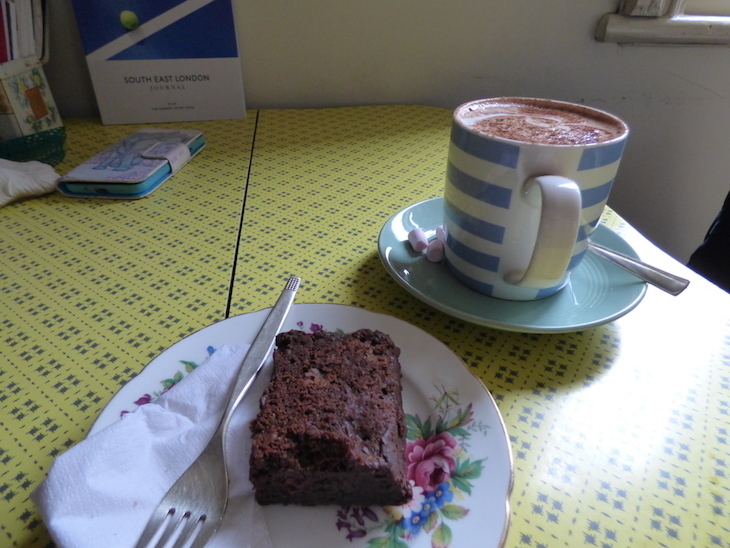 Having ordered our brownie and hot chocolate we make a beeline for the corner table, before the wooden staircase reveals itself. It was initially obscured by a voluptuous display of greeting cards, and leads up to two more cafe tables and a sofa area. We head up and manage to nab the final table — we can only imagine how busy it gets at the weekend, but on a Wednesday lunchtime, our neighbours soon vacate and we've got the place to ourselves. The decor up here is 1970s kitsch. A plastic dog, no discernible purpose, adorns our yellow formica table. 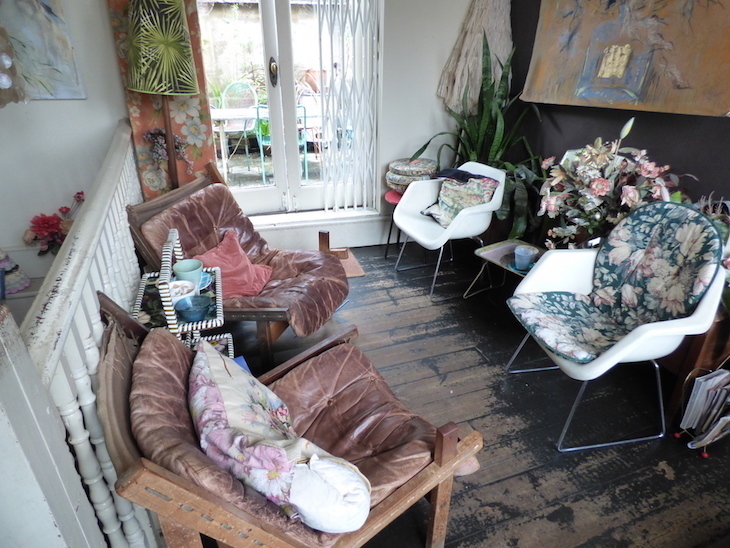 Aged leather and clashing floral prints rule, all brought together on worn wooden floorboards. Pot plants — some living, others plastic — take up almost every flat surface. It's a visually busy place, but in a homely, cosy way, and makes a change from the identikit coffee shops that adorn most high streets these days. When the shop phone rings, a satisfying old fashioned trill carries up the stairs, conjuring up images of rotary dial phones. 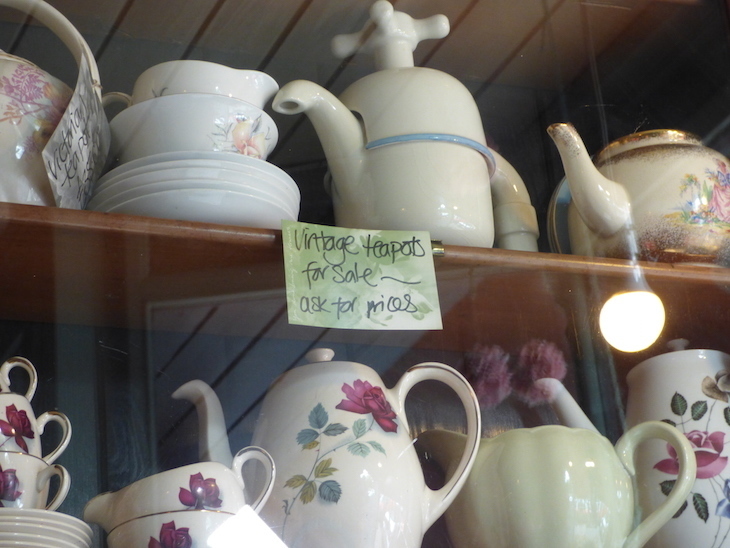 Our order is served on deliciously mismatched vintage and retro crockery. It'd be easy to miss the terrace, located upstairs through a set of patio doors. 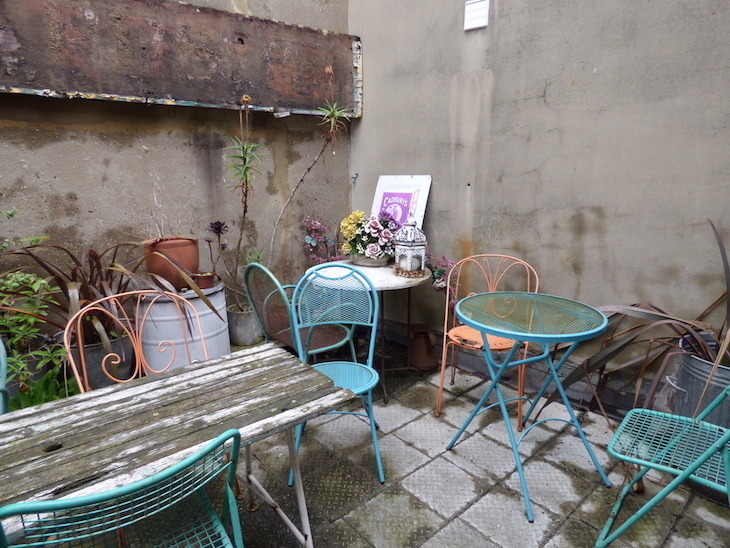 Again, it's a small area, and predominantly concrete, but it's brightened up with orange and blue metal chairs and tables, a couple of potted plants dotted around. Fenced in by the walls of the surrounding properties, it feels like a proper little secret despite being no bigger than 10ft by 10ft. Fed and watered, we head back downstairs and take proper stock of the decor down here. 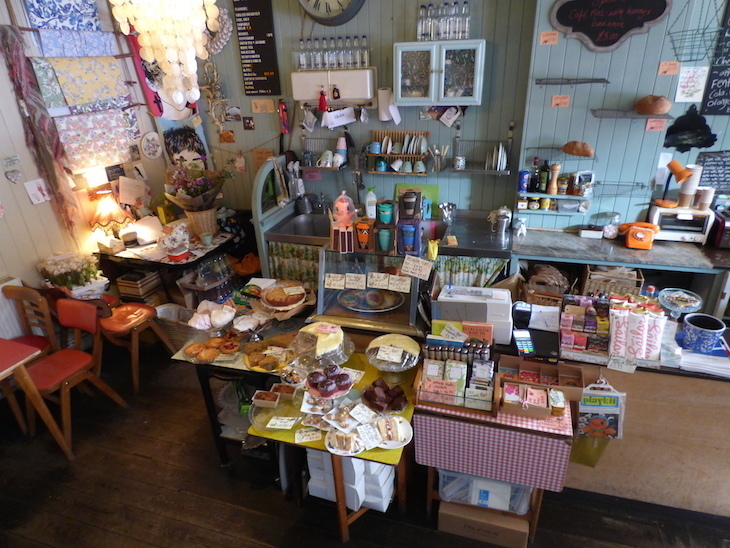 Looking down on it from the staircase, the store looks like a toy shop, somewhere a child would play. It's a comforting mishmash of objects, colours, and time periods. 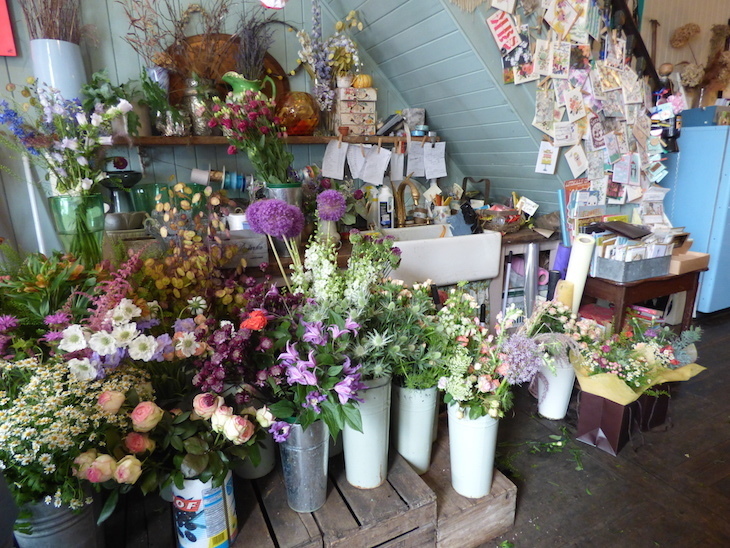 An ample selection of flowers blooms in the shop window, the staff buzzing around watering and primping them. Other bits and pieces for sale are dotted around the shop, including wrapping paper, sweet and cards. Stepping back out onto the drizzle-drenched pavements of south-east London feels a little bit like shrugging off a cosy blanket and stepping out of a time warp back into the present day.